More information can be found at www.aboutgolf.com. So, you have never tried out a golf simulator? Does your thirst for playing the great game of golf go un-quenched during the Winter months of Central Illinois? Keep reading. 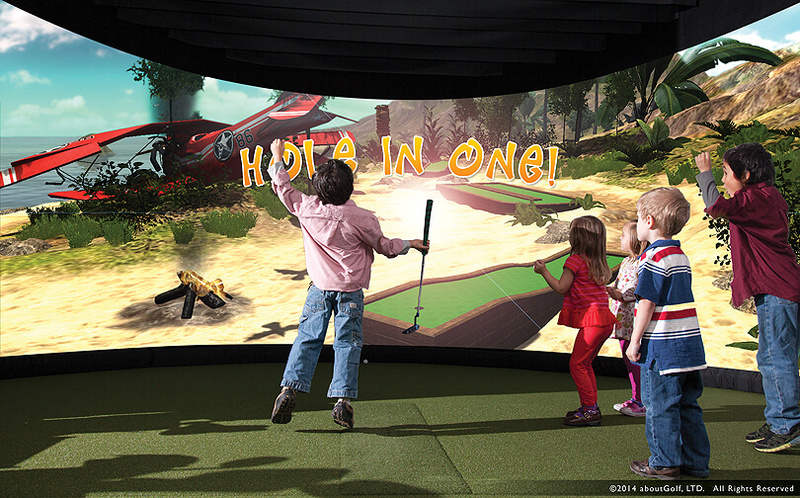 A golf simulator is the combination of a virtual space and real life. Our simulators are about 20ft x 15ft and about 11 ft tall. 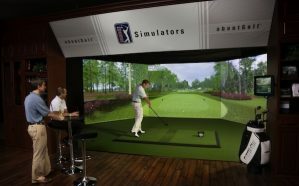 A player stands in the center of the simulator and hits a real golf ball into a wall/screen. The ball drops to the floor after hitting the screen and your swing and the direction of your shot are instantly calculated from optical sensors and cameras. This data is then instantly turned into video and you see your shot flying through the air toward the pin. If you hit a bad shot, it will register as such. If you hit a great shot, see Jordan Spieth video, the simulator will reward you handsomely. Cameras are becoming the norm in golf simulation. In general, one, two, three or four cameras are used that continuously monitor the play area. The downward swing path, impact, club face angle, launch angle and ball speed are all captured by the high speed cameras, normally running at around 100 to 120 frames per second. Camera data is processed using complex physics algorithms to produce a multitude of data such as back spin, side spin, trajectory, club face angle, swing path, loft, distance, carry and roll (source). In conclusion, it’s going to be awesome. See you at The Clubhouse!